November 17, 2012 at 10 am, over 150 people came to Evie's Memorial Service to celebrate our sweet girl. It was a perfect celebration, a perfect intermingling of joy and sorrow. We had the amazing opportunity to hold Evie's Memorial Service at Norfolk Botanical Garden, thanks to a wonderfully gracious friend who works as an event coordinator there. It was an absolutely perfect location. This particular venue provided tables and chairs, but we had to bring our own sound equipment, extra tables for food, and decorations. Make sure to check with your venue to see what you will need to provide on your own. Butterflies are also a significant reminder of Evie, because of a very unique encounter. They, too, had their place in the Memorial theme. 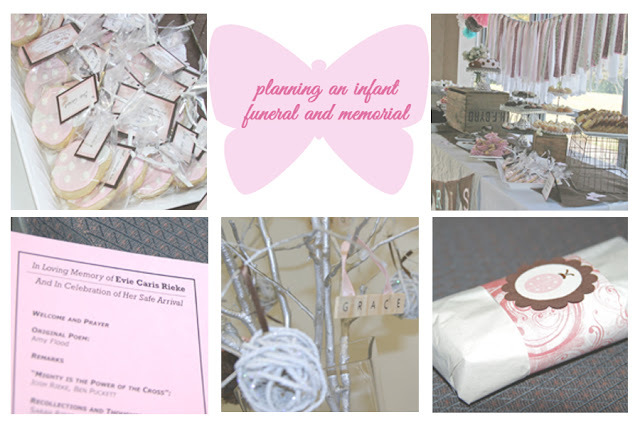 A theme is not required, but if there has been something specific that makes you think of your little one, consider including it in their Memorial service. Because we had so many people supporting us through our Evie-journey, Josh and I decided to open up Evie's Memorial Service to anyone who wanted to attend. We put an invitation out on facebook and also in our church's bulletin. If you would rather your child's service to be more private, that is, in my opinion, a perfectly acceptable decision. At such a vulnerable time, you should not try to plan for more people than you can handle. The songs I chose were all very special to me throughout my pregnancy with Evie. Also, I felt very strongly that I should say something at her Memorial, but don't feel pressure to do so if your hurting heart can't handle it. Our church family is so amazing. The entire menu was dreamed up and perfectly executed by some very wonderful women. The food included fruit and veggie trays, chicken nugget trays (donated by the manager of a local Chic-Fil-A after she heard our story), mini sandwiches, and lemonade to drink. There was also an entire dessert spread with cakes and cupcakes, chocolate-covered strawberries, marshmallows, and cake pops. I didn't eat while I was there, but was very happy to dig into the delicious leftovers afterwards! I was in the unique position to be able to think through many of these things beforehand. I realized pretty early on in the planning process that I should start to think of Evie's Memorial Service like a wedding: plan and delegate, and then allow others to carry everything out on the big day. I highly recommend this for many reasons, not the least of which is your emotional/mental state. Grief will jumble your brain like nothing else. In the end, just make sure you celebrate your little one in a way that is special and meaningful to you. You want to look back and think, for what it was, it was wonderful. for what it was, it WAS wonderful. A perfect celebration of a precious life, gone too soon. I am so grateful that I was able to help in a small way. You and Josh mean a lot to us, and it was our honour to be able to do small things to help such a dreadful occasion turn into something that honoured the Lord and showed the world what a treasure Evie was. The thought and care that you put into the planning and detailed showed your heart in a very good way.